This is another new commission for the 7th Dimension. An epic space adventure written in which Mars is portrayed as a dying planet where desperate Earthmen compete with the last Martians and other alien races for lost knowledge and hidden power. NOTE: This is being broadcast in 2 parts on successive Saturday evenings with repeat broadcasts at Midnight (Sunday). And remember BBC7 provides the Listen Again service to catch both of these gems for 6 days following the broadcast! BBC7 and The 7th Dimension have Matheson’s Duel again! 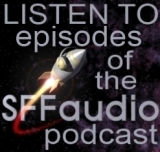 Zombie Astronaut adds a podcast feed!